Since his passing on November 30, 2018, there have been dozens of tributes worldwide to the 41st President of the United States, George Herbert Walker Bush. You can’t speak about this great American without mentioning golf in some way. He simply loved the game. While in office, he had a putting green installed in the White House. 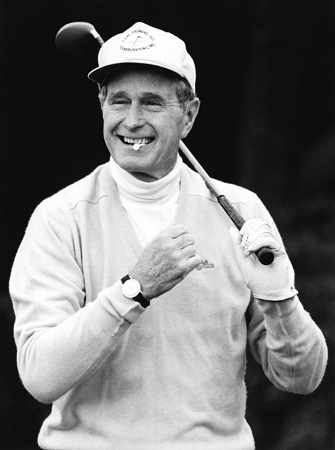 While his handicap was in the mid-20s during his four years as president from 1989-93, he always appreciated a quick round of golf. Bush did not dally on the course, and reportedly finished most of his 18-hole rounds in less than two hours while in office. The former president’s favorite course was his home course, Cape Arundel Golf Club a few miles from his Kennebunkport, Maine home. In 2017, RV Life published a book review “I Call Him Mr. President—Stories of Golf, Fishing, and Life with My Friend George H. W. Bush” which was written by Ken Raynor along with Michael Patrick Shiels. The book recounts numerous intimate stories about the president and his time spent at Cape Arundel Golf Club. George H. W. Bush doing what he loved most. 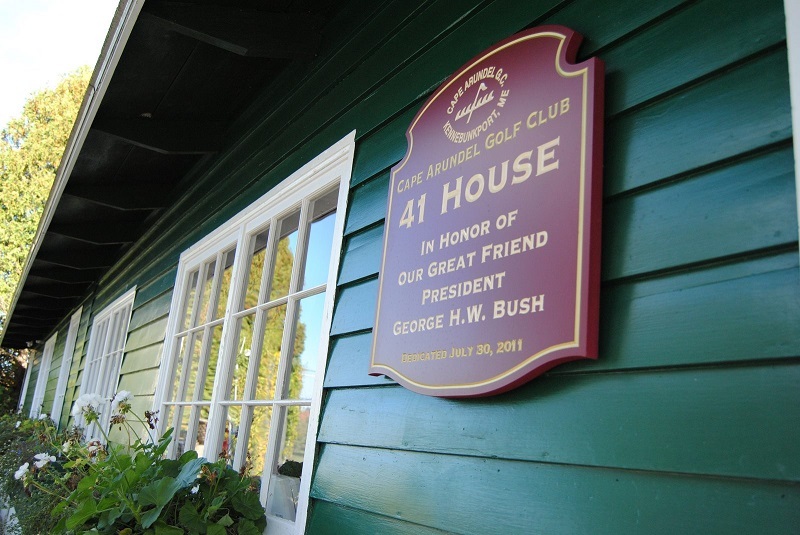 To show its appreciation for his longtime patronage and friendship, Cape Arundel Golf Club’s historic hunter green clubhouse overlooking the Kennebunk River was renamed as 41 House in 2011 to honor the club’s most famous member and 41st President of the United States George H.W. Bush. Inside the clubhouse, which was originally built in 1900, the walls are filled with presidential memorabilia. Some of those items include his presidential golf bag along with numerous photos of celebrities and professional golfers like Davis Love III, Phil Mickelson, and Arnold Palmer. In 2009, the United States Department of the Interior added the iconic Cape Arundel Golf Club to the National Register of Historic Places. This listing indicates that the course and property are considered worthy of preservation and protection as part of America’s cultural heritage. The golf course isn’t too bad either. The par 69 Cape Arundel Golf Club measures 5,881 yards from the longest tees. Though short in length, the course features spectacular greens, which were designed by Walter J. Travis. The course opened in 1896 and is a members-only, but guests are welcomed. If your travels take you to Maine, make Cape Arundel Golf Club a must-visit destination. Even if you are not a golfer, you will appreciate the beautiful setting, nostalgia, and history lesson about the 41st president of the United States. May you rest in peace, Mr. Bush.